All transactions are safe and secure with a reliable history in online purchasing behind each of our associates. 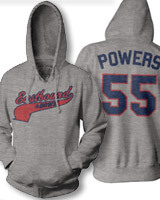 Buy the Eastbound and Down Hoodie to own Eastbound and Down clothing and merchandise. If you want to be like Kenny Powers...before he got kicked out of the pros, then this Eastbound and Down hoodie is for you. Like the shirt it features the logo on the front and "Powers 55" on the back, mimicking the famous Kenny Powers jersey. Remember that imitation is the sincerest form of flattery. This sweatshirt is a perfect start for any Kenny Powers costume. When added to a pair of jeans and a brown curly mullet, you could be him. Wear it over the matching Eastbound and Down tee. In addition to the Eastbound and Down Hoodie above, browse the Eastbound and Down Clothing Gallery for more apparel like men's and women's clothes, kids shirts or hoodies.